Ever see someone do something super cool, and think you’d really like to try doing it yourself? Free climbing El Capitan, bull riding, and body suspension never made my list, but gymkhana sure did. I’ve had a burning desire to ride a small motorcycle through a forest of multi-colored cones littered about a huge parking lot for years. 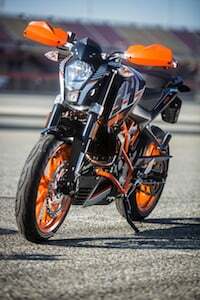 Recently, SoCal’s own M Gymkhana and KTM gave me and fellow gymkhana-curious editor, Troy Siahaan, the opportunity. Like our ice racing expedition a few years ago, the gymkhana experience was a fun and challenging task. Having ridden 170+ horsepower superbikes the previous day (The $17,000 Superbike Faceoff), Siahaan and I had to uncouple our brains from the warp speeds attained around the banking of Auto Club Speedway, and recalibrate them for the parking lot speeds of moto gymkhana. Which is a selling point of moto gymkhana competition; the consequences of making a mistake are relatively inconsequential compared to a high-speed track day get off. The bike, too, suffers less, especially if you’re using one of the KTM 390 Dukes M Gymkhana has available that are outfitted for the occasional low-speed tip-over. Whether you’re a recent MSF graduate or a seasoned motorcyclist, a day of gymkhana riding will endow you with a renewed appreciation of bike control. From steering with your hips, looking ahead to a corner that’s behind you, clutch, throttle and brake manipulation gymkhana manifests all the basic motorcycle skills, then elevates those skills the faster you go. If you’ve seen the Exorcist you know the degree of rotation required to see the next turn on a gymkhana course. Roderick isn’t turning his head near enough to see the next turn behind him. Bike control isn’t the only skill necessary for increasing your speed around a gymkhana course, observation and memory are just as important. Cones of different colors indicate which direction to turn, as well as how many times to make the turn. M Gymkhana uses blue cones for left turns and red cones for right turns. Sometimes these turns are sharp, other times wide. Blue or red cones with yellow tops indicate a turn of more than 270 degrees before proceeding. Sometimes you touch an imaginary line with your front wheel, while other times you enter a gate, execute a U-turn and exit through the same gate. It’s all confusingly fun as long as you don’t get frustrated. Memorizing the course is the best way to lower your lap times. You’ll be anticipating what comes next, preparing for the maneuver in advance and executing in a fluid motion rather than having to think about what you’re doing. It’s just you against the clock, with no getting an excellent drive off a corner and onto a long straight to make up time. The only way to lower your laps times is going quicker through the slow stuff – which is pretty much the entire course. 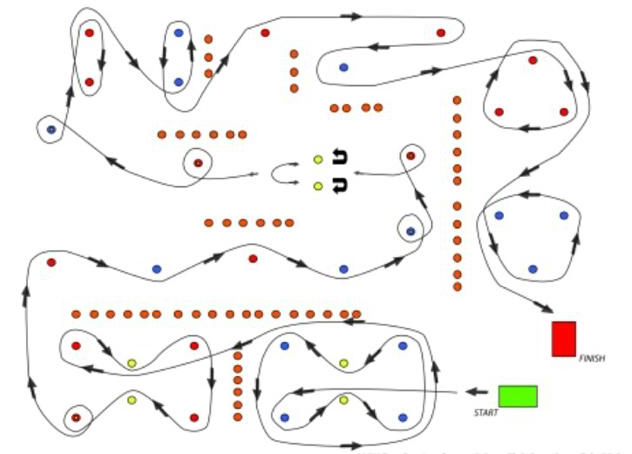 M Gymkhana track map #2 – the longer of two tracks we rode that day. Easy peasy lemon squeezy… right? The gymkhana couple encourages motorcyclists of any skill level to bring their own bike – the motorcycle you are most comfortable with – and give M Gymkhana a try. Or, if you don’t want to chance dropping your precious, try a 390 Duke. For 2016, KTM became an official sponsor of M Gymkhana. 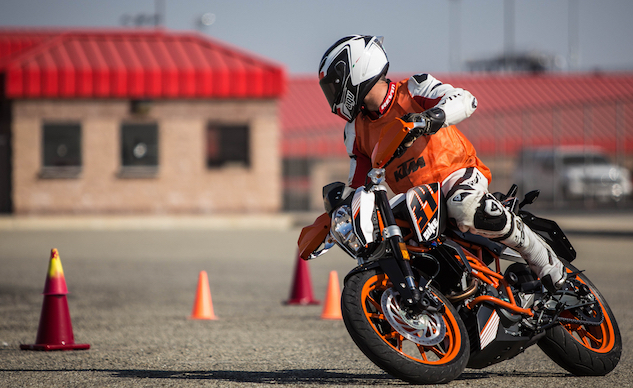 Small, light and unintimidating, the KTM 390 Duke is the perfect steed for conquering a gymkhana course. For 2016, you can enter the M Gymkhana KTM Cup World Competition. “KTM sponsoring the series with the 390s is a great idea. They are small and nimble, so newer riders won’t be too intimidated, yet have enough torque to jump from one section to another without needing to change gears. Plus with all the crash protection they come with, a rider doesn’t have to worry about dropping their own bike,” says Troy. The 390 Duke isn’t exclusive to any one person for an entire day, but they are available to use throughout the day at no extra charge. 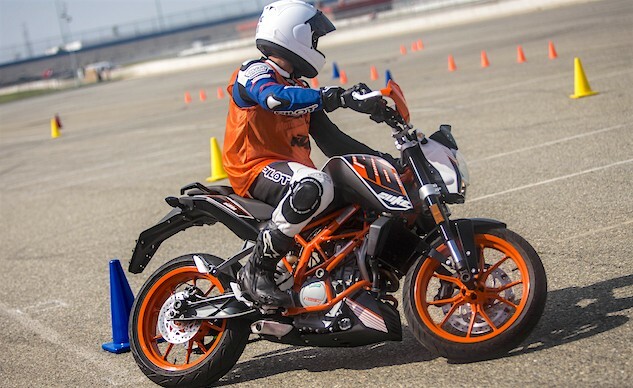 To come to an M Gymkhana event watch and take a few practice laps aboard at KTM 390 Duke JB charges only a $15 pittance. 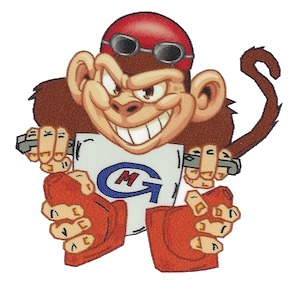 An M Gymkhana day aboard your own bike will only set you back $75 to $130, depending on venue and amount of days. For more information, event dates and venues check out the M Gymkhana website, sign up, then go have a blast. It’ll be an afternoon well spent, challenging yourself, improving your skills while having fun chasing better lap times. Bring a friend because a little competitive camaraderie between riding buddies makes the cold beer at the end of the day taste better!